The Commercial Triangle program aims to regenerate the heart of downtown Athens. The area has a strong commercial character and is full of family businesses that go back almost 100 years. The real protagonists of the area however, are its people. Retailers who sell door knobs, lace and fabric, jewellery materials and ecclesiastical items, residents, but also publishers, booksellers, architects, graphic designers, painters, photographers and dance teachers scattered in ateliers and dance studios. We are currently running a series entitled “Humans of Commercial Triangle” which regularly features on the Athens Trigono facebook page. We feel that these portraits perfectly encapsulate the spirit of the neighborhood. 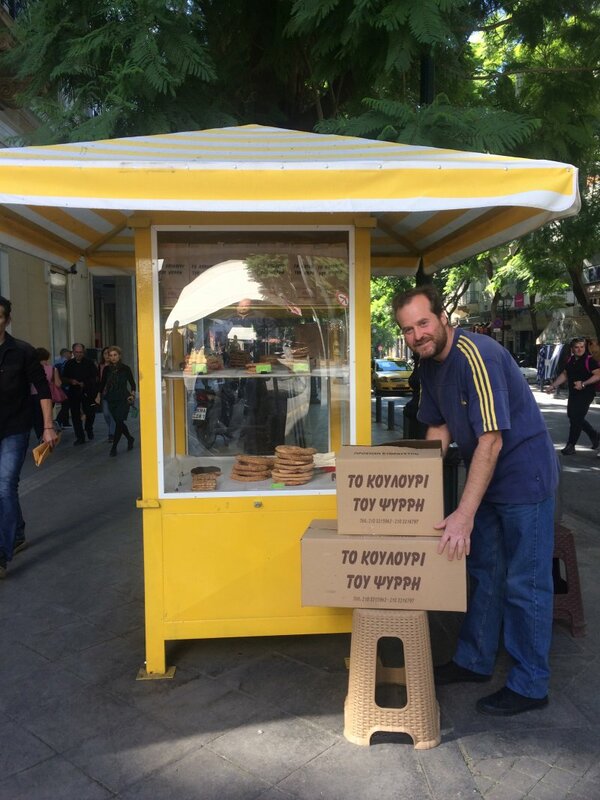 Our most popular profile so far is Iosif Konstantinou a koulouri street vendor. Koulouri, a Greek breakfast street food staple is a plain, circular bread topped with sesame seeds and it’s usually sold at kiosks in Athens’ streets. The industry for street vendors is strictly regulated with special licenses for specific spots, granted by the Municipality of Athens. This is Iosif’s story. “I'm the newest koulouri vendor in the area. I started a little more than a year ago. Me and my wife managed to get a koulouri-vendor license. I used to work in an IT company, but now I am holding down two jobs. I am at this exact spot every morning selling koulouri from 6.00 am until 14.00. From here I move on to my second job as a receptionist where I finish at 20.00 in the evening. When I first started selling koulouri I was almost desperate. It was hard. I remember this one Saturday, where I only sold 25 pieces. As time has gone by though, things have gotten better and I am feeling optimistic. I always try to win my clients over. I get my koulouri delivered every few hours so that it’s always fresh and warm. I sell more on weekdays than the weekends. Koulouri is best eaten at a desk in an office! The tourists in Athens- Germans, Turks, Russians, Chinese- are curious they always stop and ask me about koulouri- what is is, how it is made. They like taking pictures but they don’t always try the goods! I sample my koulouri on a daily basis. I want it to be really good every single day”.